It’s good to be a man, isn’t it, men? Phone conversations are over in 30 seconds flat. A 5-day trip requires only one suitcase. But, then there is Father’s Day. Here we lose out. Although Father’s Day is just like Mother’s Day, not much is spent on a gift, if any at all, or we end up paying for it. Unfortunately, fatherhood is not doing well in our society. Fifty years ago, an American child could reasonably expect to grow up with a dad. Today, an American child can reasonably expect to grow up without one. Low moral standards and a welfare system that encourages single parenting have caused the breakup of the American family. This is causing great harm to our society. Studies of criminals have found that more than 70% of inmates in state penal institutions come from fatherless homes. Children from broken families are nearly twice as likely as those in two-parent families to drop out of high school or become unwed mothers. Positive role models of fathers are missing from our homes. Without good fathers, boys don’t know how to act like a man. Girls don’t know what to look for in a husband. They have to look elsewhere for their examples. Unfortunately, they often choose poor examples or decide fathers are unnecessary since they never had one. Now, more than ever, we need positive role models of fatherhood, and I believe that Joseph is one of them. If you were watching a play about the birth of Jesus, the cast of characters associated with the story of Jesus’ birth is often recognized by their unique speaking parts. The angel Gabriel makes the unforgettable announcement to Mary. Mary, whose divine selection humbles her, offers a beautiful hymn of praise and thankfulness. With dramatic words, the Angels take center stage to announce the birth of the Savior to shepherds in the field, saying, “Glory to God in the highest, and on earth peace, good will toward men” (Luke 2:14). The shepherds go to the manger to see a baby wrapped in swaddling clothes. Then they become early evangelists—telling everyone about the newborn Messiah. The wise men follow a new star in their search to find the newborn King and present Him with gifts of honor and worship. They tell Herod that the Messiah has been born and then return to their countries by another route after seeing Jesus. Then there is Joseph. Oddly enough, Joseph has no speaking part anywhere in the Bible. No notable lines are attributed to him. No sound bites. No quotes. Only silence. 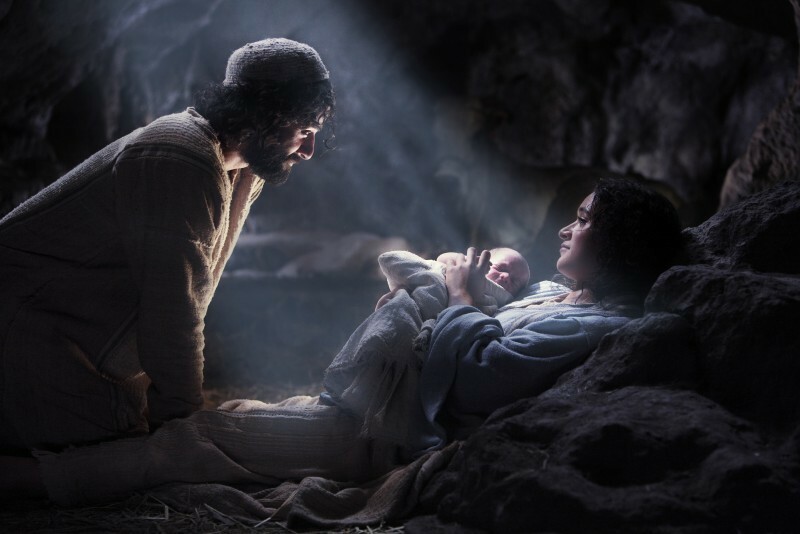 However, Joseph is irreplaceable in the story of Jesus’ birth and upbringing. And through his silent actions, Joseph teaches us valuable lessons in fatherhood. The first lesson is a lesson in righteousness. We are introduced to Joseph in the middle of a personal crisis. Having become engaged to a beautiful young girl, he has worked hard to establish an income to support his new bride and begin a family. He’s in love. He’s committed to Mary. He believed she was committed to him—that is, until he hears the news that his precious bride is pregnant. Heart-broken and betrayed, Joseph probably wondered how he should respond. Should he publicly shame her? Should he turn her over to the authorities to be stoned to death? It was his right to do so. After all, her explanation of the pregnancy was unbelievable. If Mary wasn’t stoned on the charge of adultery, she could be stoned on the charge of serious blasphemy. In spite of his hurt and disappointment, Joseph chooses the path of mercy. Before any divine explanation, Joseph chooses kindness and discretion. No malice. No explosion of anger. Certainly he could have asked a lot of questions here: “How could you do this to me? Who’s the father?” But, no words are recorded, only tenderness. He might be the gossip of Nazareth. His friends might make snide comments. But he would not hurt Mary, no matter what it seemed she had done to him. When he could have demanded a harsh sentence, he chose mercy. That is love and righteousness. It is righteous because it is the same thing God shows us: mercy and love. That is how we fathers should treat our wives and children. The next lesson we learn from Joseph is responsibility. After making his plans to discreetly divorce Mary, God gave Joseph a glimpse of the divine plan through a dream. Matthew 1:20-21, 24-25 But as he considered these things, behold, an angel of the Lord appeared to him in a dream, saying, “Joseph, son of David, do not fear to take Mary as your wife, for that which is conceived in her is from the Holy Spirit. She will bear a son, and you shall call his name Jesus, for he will save his people from their sins.” …When Joseph woke from sleep, he did as the angel of the Lord commanded him: he took his wife, but knew her not until she had given birth to a son. And he called his name Jesus. Joseph believed God and was willing to obey! He would take Mary to be his wife and let her remain a virgin until she had given birth to Jesus. He would obey God in spite of the fact that this child would be born under a cloud of adultery, for which he was not guilty. He adopted the child as his own, calling Him “Jesus” (which means “savior”) just as he was told to do. Joseph believed God, obeyed God, and accepted the fatherhood responsibility that God gave him. The key to being a good father is being a good man! Goodness is a fruit of the Holy Spirit. Therefore, to be a good father, we need the Holy Spirit within us. If we believe God and are willing to obey, the Holy Spirit will make us noble, righteous, and responsible like Joseph. It has been said, “One of the best things a father can do for his children is to love their mother.” That’s what Joseph did. He loved Mary, even when he thought she wasn’t faithful to him. In the midst of his own pain, Joseph wanted to do what was best for Mary, which required sacrificing himself, his reputation, and parenting a child that was not his. If we want to be good fathers, we also need to love our wives, in spite of their actions, our own hurt, and our disappointment. It is our responsibility to lead our wives in the following Jesus, who will change them and us. We lead by sharing the Word and setting an example of obedience to the Word. Ephesians 5:25-30 Husbands, love your wives, as Christ loved the church and gave himself up for her, that he might sanctify her, having cleansed her by the washing of water with the word, so that he might present the church to himself in splendor, without spot or wrinkle or any such thing, that she might be holy and without blemish. In the same way husbands should love their wives as their own bodies. He who loves his wife loves himself. For no one ever hated his own flesh, but nourishes and cherishes it, just as Christ does the church, because we are members of his body. Fathers, it is essential for a happy marriage that we love our wives, as these verses tell us. And, it is essential for the welfare of our children. Children are always watching their parents and learning from what they see. If they see disrespect, statistics show that it will carry into the children’s marriage. If they see verbal, mental, or physical abuse, children will think that is normal. If there is little value given to spouses, children will use that model in their future homes, families, and marriages. On the other hand, if they visibly see love, forgiveness, and respect, it will be modeled in their marriage and family. If the father loves the mother and the mother respects her husband, then that is exactly what the children will desire and create in their marriage. If the parents treat one another as valuable, as loved, as honored, then that will carry into the children’s lives as they grow older. There are other ways to train our children. Dads, we can’t leave the raising of our children to the television or the daycare teacher or only to mom. It’s our responsibility regardless of how busy we are. God will hold us accountable. We need to be actively involved in our children’s lives, especially in their formative years. Whatever you plan on teaching your children (values, morals, etc.) must be taught within the first five years—after that, it’s just reinforcement. And they need lots of reinforcement, especially by example. Dads, learn from Joseph’s example—put the remote control down, get up off the couch, and spend some time with your kids—take responsibility. Get down on the floor with them. Play baseball with them. Take them to the park. Take them to church. Have daily family devotions that teaches the Bible to your children. Pray with them every day. That brings us to another lesson Joseph teaches us—a lesson in faith. Luke 2:22-24, 39-41 And when the time came for their purification according to the Law of Moses, they brought him up to Jerusalem to present him to the Lord (as it is written in the Law of the Lord, “Every male who first opens the womb shall be called holy to the Lord”) and to offer a sacrifice according to what is said in the Law of the Lord, “a pair of turtledoves, or two young pigeons.” …And when they had performed everything according to the Law of the Lord, they returned into Galilee, to their own town of Nazareth. And the child grew and became strong, filled with wisdom. And the favor of God was upon him. Now his parents went to Jerusalem every year at the Feast of the Passover. Joseph knew the Lord and His teachings. He obeyed everything in the Law of Moses to the best of his ability. Their annual pilgrimage to Jerusalem demonstrates that Joseph was dedicated to seeking God and leading his family into a deeper relationship with their heavenly Father. We don’t know what Joseph said, but we know Joseph was a doer of the Word of God. Incidentally, James, who wrote these words, was also a son of Joseph and a brother of Jesus. The point is—Joseph was a devout man. He raised devout children. A father is not only the head of the house and the primary bread-winner, he is also the spiritual leader of the family. Dads, you—more than anyone else in the world—are able to instill faith in your children. You—more than anyone else—are able to show them what a loving father looks like. You—more than anyone else—can give them the ability to trust and depend on their Father in heaven. But you can’t give what you don’t have! Before your children can see Christ in you, you have to let the Holy Spirit into your heart and into your life. You have to seek Him, to make Him your top priority. You have to love God with all your heart, all your soul, all your mind, and all your strength. When you do, your children will see it and believe it. Joseph trusted God to lead him. He didn’t have any parenting books, any training on how to be a father to the Son of God, but he possessed faith and compassion. He followed God’s instructions—taking Mary as his wife, journeying from Nazareth to Bethlehem, then to Egypt, then back to Nazareth. Joseph was simply known as a carpenter, but he was a father to the Messiah as well as to several other children. Was Joseph a perfect father? No, of course not. The last we hear of Joseph is when he made a pilgrimage to Jerusalem with his family. Jesus was 12-years old. During the return trip to Nazareth, a whole day passed before Joseph realized Jesus was not with them. Imagine the panic and sense of failure Joseph felt. He had lost Jesus! Was He kidnapped? Was He hurt? This went on for three days! Luke 2:42-52 And when he was twelve years old, they went up according to custom. And when the feast was ended, as they were returning, the boy Jesus stayed behind in Jerusalem. His parents did not know it, but supposing him to be in the group they went a day’s journey, but then they began to search for him among their relatives and acquaintances, and when they did not find him, they returned to Jerusalem, searching for him. After three days they found him in the temple, sitting among the teachers, listening to them and asking them questions. And all who heard him were amazed at his understanding and his answers. And when his parents saw him, they were astonished. And his mother said to him, “Son, why have you treated us so? Behold, your father and I have been searching for you in great distress.” And he said to them, “Why were you looking for me? Did you not know that I must be in my Father’s house?” And they did not understand the saying that he spoke to them. And he went down with them and came to Nazareth and was submissive to them. And his mother treasured up all these things in her heart. And Jesus increased in wisdom and in stature and in favor with God and man. Joseph, in spite of not being the natural father of Jesus, did all that he could do for Jesus as an earthly father. Joseph not only cared and provided for Jesus, he prepared him to leave home, and he prepared Jesus to fulfill His purpose as Savior. What a calling—to be a parent to the Son of God! Imagine the Son of God being submissive to you! That would be an awesome responsibility. Fathers, we need to consider each of our children, whether natural, adopted, or step-children, as a child of God. Our responsibility is no less than Joseph’s. It is an awesome responsibility and we need to love them and do all we can to prepare them to leave home. What an honor God gave to Joseph. God used him to bless all mankind. The thing that helped Joseph be a good father was he stayed in direct communication with God. Like Joseph, we fathers need to pray for our children and our wife and to God for our strength and wisdom. Our Heavenly Father loves our families more than we do. In fact, He thought up and established fathers and families. Therefore, there is no better source for our instruction in training up a child than God’s Word and His Holy Spirit. However, preparing our children for that day when they finally leave our home to fulfill God’s purpose is only part of the picture. Preparing them to live a productive life in this world, experiencing success and coping with failure, is an integral part, but it’s just a part. As fathers, we need to be preparing our children for eternity. God didn’t give us our children just to be doctors, teachers, farmers, plumbers, homemakers, or preachers. He gave them to us to prepare them for everlasting life through Jesus Christ. While we can’t choose for them, we CAN choose to show our children the Way, the Truth, and the Life that leads to salvation. We can’t decide which path they are going to take, but we can set the example and show them the Way. If we want to be good fathers, we need to love God, love our wives and children, and do all that we can do for our families, just as Joseph did. Maybe you didn’t have a good father or maybe you haven’t been a good father. God can redeem the past and make you one. Perhaps you realize you are not prepared for eternity. You have a Father in Heaven who loves you and has prepared the way of eternal life for you through faith in His Son, Jesus Christ. Get ready to meet your Father in Heaven today by believing in Jesus Christ and confessing Him as the Son of God. Repent of your sin and give your life to Jesus in baptism. You will be born again of the Holy Spirit, who will lead you to your eternal home.